Her work in Dr. Geiling’s lab provided early experience in unraveling medical mysteries. In 1937, more than 100 people, including 34 children, died after taking a liquid sulfa drug formulated with an artificial fruit flavor. Dr. Geiling’s team of scientists soon identified the problem: The medicine was composed primarily of antifreeze — along with the active ingredient, coloring, and flavorings. It was sent to market with no testing. Public outrage led to the 1938 passage of the Food, Drug, and Cosmetic Act, which required manufacturers to provide evidence to the FDA that their drugs were safe. Fast forward to 1960, when her family moved to Washington, D.C. Dr. Kelsey accepted a job at the FDA, evaluating applications for new drugs to ensure their safety. She would be one of a handful people on a bare-bones staff. The system was rigged in favor of big business: If regulators didn’t respond to an application within a 60-day window, the drug would automatically hit the market. In September 1960, when Dr. Kelsey received an application for a West German sleeping pill called Kevadon, she was expected to rubber-stamp its approval — after all, it was already popular in Europe. Instead, unsettled by scant information on the drug’s safety, which consisted mostly of testimonials rather than science, she demanded the manufacturer provide additional data and conduct further safety studies. She was specifically concerned that the company had not sufficiently demonstrated that the drug could not cross the placenta, as the company hadn’t performed experiments on pregnant animals. The pharmaceutical company pushed back, not just directly against Dr. Kelsey, but also against her supervisors, to whom they lodged complaints about the “bureaucratic nitpicker.” A game of tug-of-war persisted for more than a year as Dr. Kelsey insisted on more data, which the manufacturer reluctantly and incrementally provided — upset that her stubbornness was costing them millions of dollars in profits. However, the additional data they provided never met Dr. Kelsey’s standards. In November 1961, Dr. Kelsey’s careful vigilance was vindicated. Kevadon, more commonly known as thalidomide, had been taken off the market in its native West Germany. By that time, it had been shown to cause severe birth defects in tens of thousands of babies in Europe, Britain, Canada, and the Middle East. Though it was initially marketed as a sedative, doctors in Europe had also prescribed it to pregnant people to suppress morning sickness. Its West German manufacturer marketed it as “completely safe for pregnant women and nursing mothers without any adverse effects on mother and child” — despite never having tested its effects on a developing embryo. Though thalidomide caused irreversible nerve damage in some adults, it gained notoriety for its toxicity during pregnancy, when it could cross the placenta to damage the fetus. According to the New York Times, many children “were born without arms or legs, some with no limbs or with withered appendages protruding directly from the trunk. Some had no external ears or deformities of the eyes, the esophagus or intestinal tracts.” One estimate holds that, worldwide, 20,000 babies were born with deformities, while 80,000 died in utero or shortly after birth. 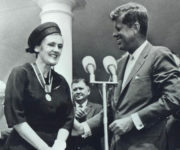 President Kennedy presents Dr. Kelsey with the nation’s highest federal civilian service award in 1962. The next year, in 1962, Dr. Kelsey was rewarded for her work by being put in charge of the FDA’s newly created Investigational Drugs Branch. She was also involved in setting up institutional review boards, bodies of outside observers who ensure participants in medical and scientific studies are treated ethically. On the legislative front, the thalidomide tragedy galvanized the movement to strengthen drug regulations. A 1962 law mandated that drug companies conduct clinical trials to test drugs’ safety and effectiveness, obtain informed consent from all trial participants, submit trial data to the FDA, and fully disclose side effects. Dr. Kelsey’s career continued its upward trajectory until she retired in 2005. Today, the drug-approval process takes between eight and 12 years, and involves many stages of stringent testing. When people complain about government bureaucrats, think of Dr. Kelsey and the lives she saved by being a stickler for details and demanding greater scientific rigor. Dr. Kelsey’s work to improve the standards by which we evaluate drugs constitutes an incredible legacy, but it is in danger of being undone by the current president’s administration, which seeks to erode regulations on pharmaceutical companies — and also helps to sow distrust of the scientific method. Dr. Kelsey died in 2015, at the ripe old age of 101. Her legacy is an inspiration — and a reminder that prejudice in all its forms doesn’t just harm the targets of that prejudice. As a society, we also cheat ourselves when we squelch the potential of anyone who doesn’t fit into a preconceived mold. Imagine what world we might be living in if Frances’ name had been Mary, and someone decided that a Mary didn’t belong in pharmacology in the first place. This entry was posted in History, Pregnancy & Parenthood and tagged 1962 Drug Amendments, antifreeze, birth defects, diethylene glycol, FDA, fetal abnormalities, fetal anomalies, fetal development, Food and Drug Administration, Food Drug and Cosmetic Act, Frances Kelsey, Frances O. Kelsey, Frances Oldham Kelsey, informed consent, institutional review board, John F. Kennedy, Kefauver Harris Amendment, miscarriage, morning sickness, phocomelia, placenta, President’s Award for Distinguished Federal Civilian Service, stillbirth, sulfa drugs, sulfanilamide, teratogen, teratogenic exposure, West Germany, women's history, Women's History Month by Anna C.. Bookmark the permalink.